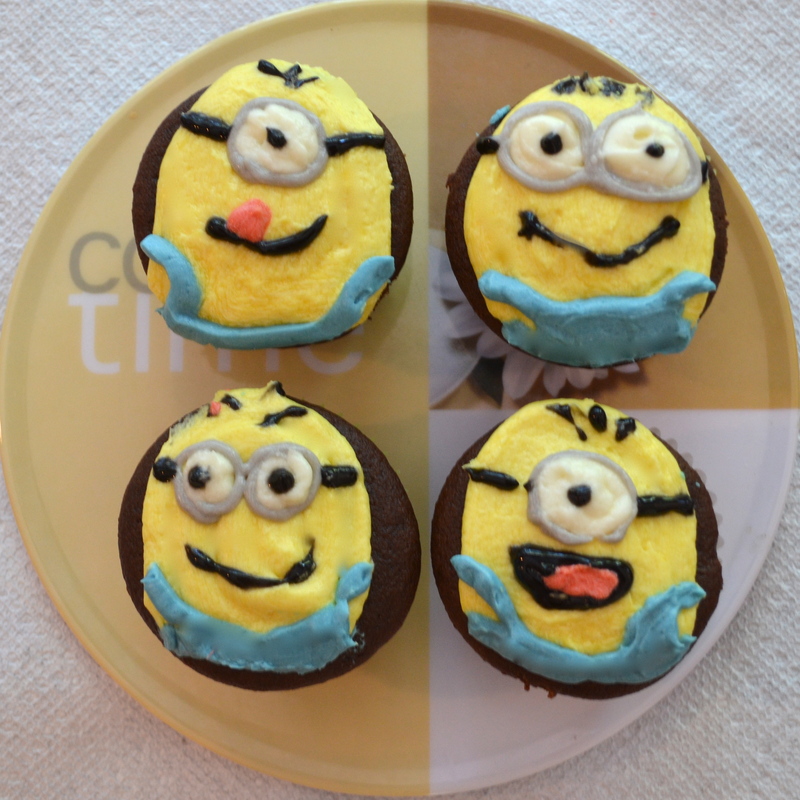 In making these minion cupcakes, I broke one of my cardinal rules of baking and used a boatload of artificial coloring. 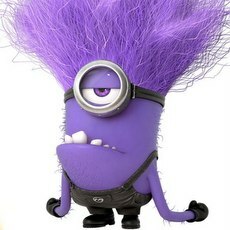 But come on, the minions from Despicable Me are just too adorable. I recently saw Despicable Me 2 in theaters. It wasn’t necessarily the best story (the plot of the first Despicable Me was better). However, the minions made the movie worth watching a second time. That is enough about the movies; this is a cupcake blog, not a movie review site. The cupcakes I made this time included a chocolate cake with a vanilla buttercream frosting. I have not ventured to the world of gum paste, which makes for more cakes with a more professional-looking design. I may soon, but the summer is, believe it or not, almost over (side note: where did this summer go?). Anyway, I used a buttercream frosting and added food coloring to it. For the yellow and blue colors, I added about 7 drops of food coloring. I bought a black gel frosting pen for the black straps on the minions’ goggles and for their smiles. I also used the black to mix it with the normal white buttercream to make the grey goggles. Considering I didn’t have enough frosting bags, I think I did a pretty good job with the makeshift bags made of Ziploc bags cut at the corner. It worked pretty well, since you need to create a flat surface for the yellow. For about 16 cupcakes, I would recommend that you use 3/4 (1 1/2 sticks) of unsalted butter. The entire process from mixing the batter to the end of frosting took nearly three hours. It was definitely worth it. The chocolate cake is nice and moist and almost melts in your mouth. 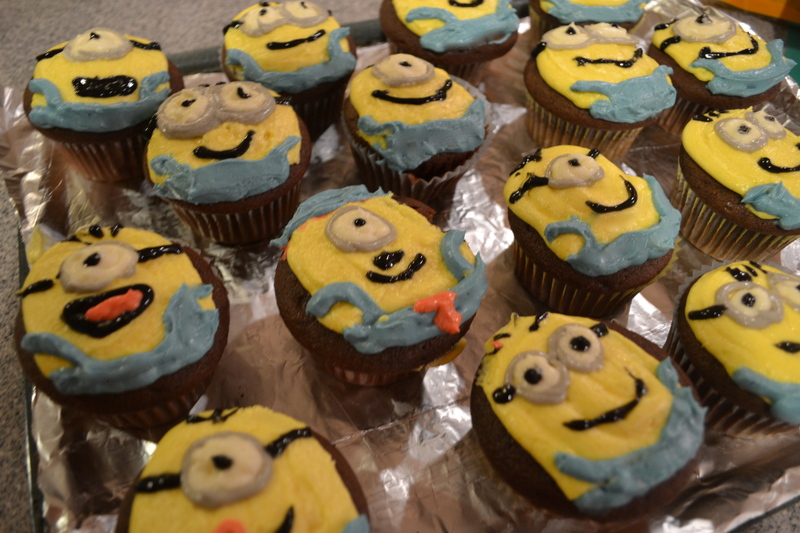 Plus you have to feel happy when you see the minions. AND the cupcakes are smiling at you. Next on my list of cupcakes to bake are the evil purple minions!